International Speedway Corporation, the operator of 13 racetracks across the country including Daytona International Speedway and Talladega Superspeedway, tempered its outlook for the second half of 2010 while reporting lower than expected net income and overall revenue in the company's second quarter. Sponsorship, hospitality, and advertising revenue could be down as much as 10% on a year-over-year comparison, International Speedway Corporation President John Saunders said on Thursday. Despite the recent signings, ISC said it faces headwind in its efforts to "upsell" existing partners on additional benefits as the season progresses. "Where you could go back to partners in previous years and have a lot of opportunity to up-sell as you go through to the season, we're hearing we are just out of budget, we spent out budget," SVP, CFO & Treasurer Dan Houser stated. "We did what we could do here early in the year and we just don't have the budgets there." While annual escalators have remained in the lower single digits for most multi-year sponsorships, the average length of ISC's deals has shortened due to more constrained sports marketing budgets the company said. "What we are seeing is – where terms used to run in the three to five-year terms pretty consistently – probably a three-year deal is a pretty long deal right now," Houser said. "And again, that goes back to the visibility on budgets that we are seeing with our partners." 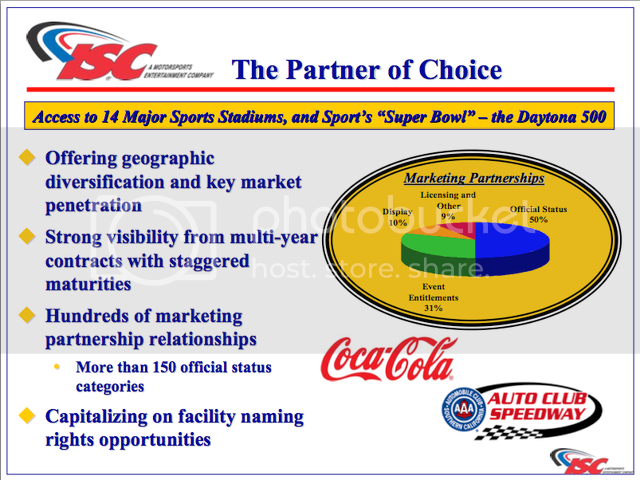 ISC has agreements in place for 91 percent of its gross marketing partnership revenue target for fiscal 2010 and has recently signed deals with Ruiz Foods, Papa John’s Pizza, and Toyota Motor Sales. ISC also signed a letter of intent with Lowe’s for its Kobalt Tools brand to serve as the title sponsor for the Phoenix NASCAR Sprint Cup Series event in November leaving ISC with only one Sprint Cup title sponsorship open (at Richmond).